Working in tech support, I constantly run into a wide variety of users who seem to know very little about taking care of their Windows computers. This isn’t necessarily their fault, since most people simply don’t have the time or patience to dig beyond the surface-level workings of their computers. Ideally, users shouldn’t have to worry about the way their computer works, but that sort of blissful utopia is still several years away in my opinion. Despite Microsoft’s penchant for buggy operating systems, in truth they do a good job of keeping both Windows XP and Vista up to date. Of course, to take advantage of these updates you need to make sure you’re actually downloading and installing them. 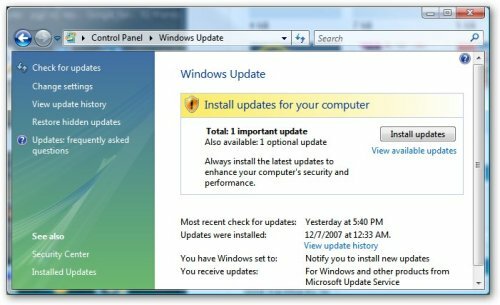 You can do this manually from Windows XP by going to WindowsUpdate.com in Internet Explorer (not Firefox), or in Vista by navigating to Start Menu > Control panel > Windows Update. Check for updates by clicking the appropriate buttons or links in XP/Vista, and then simply proceed through the installation process. If you’re an XP user who hasn’t updated in a while, you may be asked to go through some extra updates before you’re allowed to install actual Windows Updates. 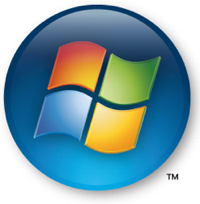 You can also configure both Windows XP and Vista to download and install your updates automatically. Personally, I recommend just enabling the option to download updates but not install them automatically. When Windows installs your updates automatically it also reboots your computer once it’s done, and this could pose a problem if you accidentally leave an unsaved document open. You’ll end up losing all of the unsaved data. To enable automatic downloading in Windows XP, navigate to Start > Control Panel > Automatic Updates. Choose the option to “Download Updates for me, but let me choose when to install them”, and click OK.
To enable it in Windows Vista, navigate to Start > Control Panel > Windows Update and select the Change Settings option on the left side of the window. Choose “Download Updates for me, but let me choose when to install them”, check off the two check boxes at the bottom of the screen, and click OK.
Once automatic downloading is enabled, you will receive notices in your system tray telling you when you have updates to install. You can either install them by clicking on the relevant icon, or, my personal favorite, choose to “Shut Down and install updates” when you click Start > Shutdown. You’d be surprised at the sort of performance improvements that you get from making sure your computer is up to date, not to mention the numerous security benefits, so it’s always a good idea to make sure you’re doing so.